When you think of an archaeologist, you might imagine a scientist in the field wielding shovels and pickaxes, screening through dirt to uncover artifacts and structures buried deep in the ground. But what about those areas that you can’t reach… or even see? That’s when you call archaeologist Lori Collins from the University of South Florida. 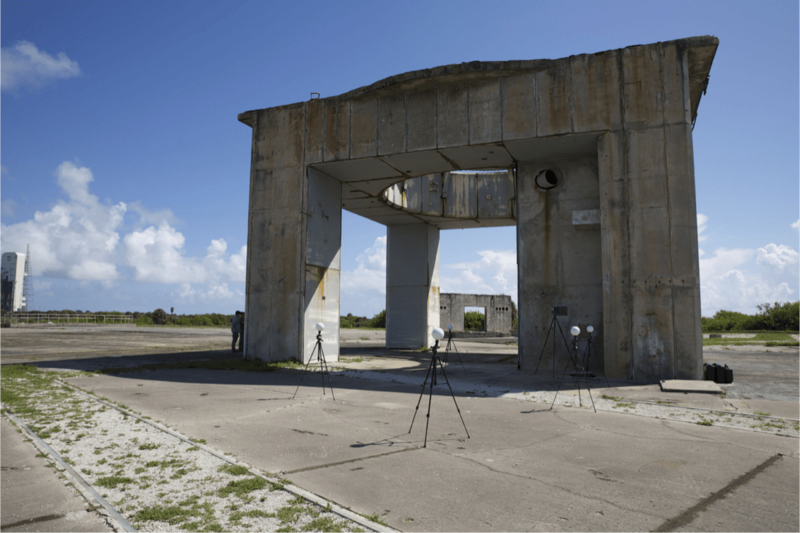 Collins uses LIDAR—a detection system that uses lasers—to map out the cracks and details of a prehistoric cat sculpture created by the Calusa people, sinkholes that pop up in Florida, and even a former NASA launch pad. In this recording of Science Friday’s live event in Tampa, Florida, she talks about how this technology can preserve these archaeological finds in the face of climate change, natural disaster, and war. Check out some of the images below that Collins and her team have mapped and modeled using LIDAR. Lori Collins is a Research Associate Professor and Co-Director of the University of South Florida Library’s Digital Heritage & Humanities Collections at the University of South Florida in Tampa, Florida. IRA FLATOW: This is “Science Friday.” I’m Ira Flatow coming to you from the Tampa Theater in Tampa, Florida. IRA FLATOW: How many times have you gone to a museum and seen a really cool artifact? You stare at every little detail and you get that urge to pick it up for just a second, but there’s always a sign that says do not touch. Well, my next guest works with a kind of virtual collection of artifacts. And the good news is you can get up as close as you want to prehistoric sculptures and even entire buildings and you can virtually touch them. You can even spin them around 360 degrees. How? Well, she’s doing all of this with lasers and she’s here to explain it. Lori Collins is co-director of the Digital Heritage and Humanities Collection at the University of South Florida Libraries in Tampa. IRA FLATOW: Now we have microphones in the audience. If you wanted to step up to the microphones and ask questions, please feel free to do that. Now, Lori, you create a type of virtual reality museum. You already have the real artifacts. But why is it important to scan them and preserve them if you have the real stuff? LORI COLLINS: Well, I think we really can just turn on the news every night and see reasons why there’s a necessity for that. And we’ve got war and conflict and we’ve got natural disasters and even things that we think are protected in a museum environment we saw in Brazil recently. We can see that these things that we want to preserve for all time, maybe there’s other kinds of techniques that we need to look at to be able to do that. IRA FLATOW: Now you use something called lidar. We’re hearing a lot about archaeologists scanning entire areas of a landscape with this, and it’s also being used in self-driving cars. What is lidar? How are you using it? We actually have a rig right here. LORI COLLINS: Yeah. There’s a lot of different platforms for it. Different resolutions and scale is really the difference between them. So lidar is light detecting and ranging that uses a laser pulse to actually detect distance and derive distance. The different types that we have include longer range and shorter range kind of applications, some that use a patterned light to actually measure defamation and distance in that way. And this we use for artifacts and for close up kind of objects. IRA FLATOW: Looks like an electric iron for my clothing. IRA FLATOW: Little more expensive I imagine. LORI COLLINS: Little more. So that emits a structured light pattern onto an object and then we’re able to derive a three dimensional measurement and figure from that. The other types of instruments that we have are meant for landscape and further out distances. So we can go out 330 meters with this instrument over here and about 120 meters with this instrument here. Lots of different configurations. We can also mount these on planes and derive the surface of the earth and three dimensional information that way. We can put them on mobile platforms. There’s a lot of different ways of collecting these types of data and information. IRA FLATOW: And how granular can you get with it? How much detail can you pick up? IRA FLATOW: Half a human hair? LORI COLLINS: Yeah. And so we can really approximate reality with that. This piece we’ve recently scanned that’s coming back to Florida, this is from the site of Key Marco. IRA FLATOW: That’s a Key Marco cat. LORI COLLINS: Yeah. It’s about 500 years old. Was found in a peat deposit at an archaeological site near Naples, Florida. This artifact, it has some preservation issues, conservation issues. And so being able to scan and document this, we worked in a partnership with the Smithsonian Institution on this one. And this is an exact replica of it. IRA FLATOW: Wow. is this 3D printing? IRA FLATOW: So it’s a sitting cat. LORI COLLINS: It’s a shape shifter. It’s actually a Florida panther. It’s a personage that’s becoming a Florida panther essentially. IRA FLATOW: It’s about as you say, it’s not very big. It’s about the size of my hand. What did you find out about how the cat was made? LORI COLLINS: Well, what’s interesting about the cat is it’s a perishable material. It’s made of wood. Often we don’t find these types of artifacts. As soon as you pull them out of an anaerobic environment they’re disintegrating. This one has some problems with it. Some cracking and some defamation going on with it. And so to be able to preserve it digitally we’re also helping the conservators with how to treat this and maintain it for future generations to see. IRA FLATOW: It’s not going to last forever, but we could have the digital version of it. LORI COLLINS: We can. And our unit is actually in the USF library. Which people are like, why are you doing 3D research in the library? Well, it’s because we want to create these digital collections and we want to be able to have these digital materials for everyone to see and appreciate and use in the classroom, for example. IRA FLATOW: And once you have it you could virtually turn it around. LORI COLLINS: You can. And we actually have an application that we use where we can do augmented reality and virtual reality tours with it. So we can actually view and see the object. Everybody can use their phone and actually check this out online and have your own little museum display right in front of you. IRA FLATOW: Love it. I love it. There was another artifact that you scanned, and it’s a powder horn that has very detailed surface. What’s the image that we’re looking at on the horn? LORI COLLINS: This horn is part of a collection with the Tampa Bay History Museum. It’s very hard for them to display this piece because it’s in the round. You can’t touch it. And so our team scanned this using the scanner that you see here, the shorter range instrument, and then we texture mapped it with a photo so that we have a very rich, detailed model. And it’s a map of Spanish Saint Augustine, actually British Saint Augustine before the Spanish. 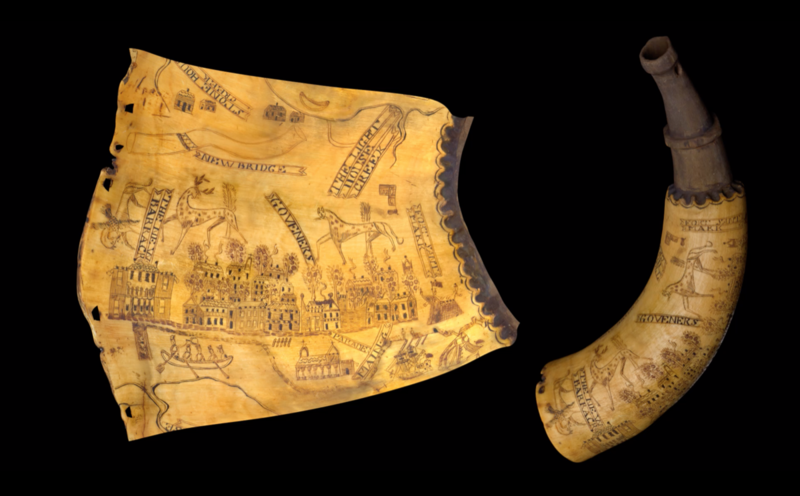 It contains a whole cityscape on this powder horn. Dates to about 1760. IRA FLATOW: In the picture you were able to take the horn and unfold it. How do you do that? LORI COLLINS: So we have this whole team of amazing 3D specialists and one of our members of our team is able to do some algorithmic change to this and actually unroll things. And so now we can all see the map that’s created that contains the Spanish St. Augustine scene that we see today. IRA FLATOW: Let’s say you go to a site, can you take one of your lidar instruments and actually sort of look through the ground to see if there’s something under there without digging it up? LORI COLLINS: So that’s a different type of technology. So these are all surface scanners, but then we can integrate and combine different types of tools. So we often will work with other geoscientists that are doing research with ground penetrating radar, for example, or other types of remote sensing radars. That will allow you to see beneath surfaces, and then we can bring those data sets together. IRA FLATOW: Who had a question up in the balcony? Go ahead. AUDIENCE: Hi, sir. Did you guys say that you use lasers? LORI COLLINS: Yeah, we use laser scanners. AUDIENCE: What are they made out of? IRA FLATOW: I told you they were going to be hard questions. LORI COLLINS: So there’s actually like a mirror in there that spins around and it emits a pulse laser light. Basically just hard plastic, ruggedized plastic. That laser in that mirror help you to collect, it moves around in a circle and it collects 360 degrees by going 180 and 180. It also collects camera images. So there’s cameras integrated into the scanners. And so after it finishes scanning it’ll take photos from the very same perspective and it can overlay the color images with the laser data. So you have measurable data and you have it look like the real thing. IRA FLATOW: I know that sometimes you will work on spots that pop up a lot in Florida. I’m talking about sinkholes. You mapped out the Land O’Lakes sinkhole that opened up. LORI COLLINS: I am not a geophysicist, although I did stay at a Holiday Inn. But no, I work with a lot of different diverse people across campus. We have some amazing research teams. And one of our professors in geosciences, Sarah Cruz really interested in this stuff. I was super interested in it because I grew up right around the corner from it. IRA FLATOW: Oh, is that right? LORI COLLINS: Yeah. So my childhood home was literally with a block away from where this happened. And so I used to ride my horse back where this happened. And so I was there when the whole development went in and I kind of had an understanding for why this might have happened. IRA FLATOW: So did you volunteer to go in there? LORI COLLINS: We did. Our whole team basically responded. We kind of feel we’re part of a community here as well. So it’s really a duty almost at the university to be a partner with the community, and whether a tragedy or disaster happens we step up and help. IRA FLATOW: OK. So you go and you scan this sinkhole. Are you able to go under the sinkhole to see why there is a sinkhole? LORI COLLINS: So again, combining sort of different sets of data and understanding of geomorphology, not something that I’m doing. We’re documenting, providing base maps for all these other researchers that are studying what’s going on under the ground. We’re really interested in this case to know, how is it spreading? Is it stable? Is it moving? And so one of the things we did was repeated mapping with it. So we were mapping for monitoring really. So we would go out like almost every day and scan and use drones to capture. We did photogrammetric techniques from our drones and were able to capture the surface elevations and the topography. IRA FLATOW: Can you learn something about a sinkhole that you would not normally learn using this technique? LORI COLLINS: In this case, what we did early on was we looked at the environmental history because I had grown up there. I knew how that development had kind of happened. And so we looked at early aerial imagery and we looked at the development as it had changed. And what they had done was they had dredged the lake and they had put dredged material up on the shore and then built on top of the dredge material. And so we were able to show that using geographic information systems approach. And so it was really important for us to know the entire history of the land and to understand what was happening today as well. IRA FLATOW: Well, let’s talk about another part of history that you are documenting here in Florida. You were mapping out Cape Canaveral. IRA FLATOW: –the oceans rising and it’s right on the coast. LORI COLLINS: It is. It’s right on the coast. They face a lot of pressures from sea level change. Just the salts are deteriorating all of the metal. To be able to document these and to really kind of use our data to tell the story of the Cape is really something that we’re looking forward to doing. IRA FLATOW: And one of the images we’re looking at now is once known as the Apollo 1 Memorial site. A very sad site. LORI COLLINS: Yeah. So this was the tragedy where Grissom White and Chaffee were in 1967. They caught fire during a test. They were locked into this capsule. They couldn’t open the capsule hatch the way it was designed, an electrical fire that took over the capsule and all three perished there. So this is now today a memorial to them that people come to every year on the anniversary. 2017 was the 50th anniversary of this tragedy. IRA FLATOW: You actually have an Apollo memorial 3D that you made. LORI COLLINS: We do. So all of our things that we’re documenting for preservation, conservation, and understanding how to preserve things at the Cape we’re also using for interpretation and we’re creating digital collections online through our library that can be accessed. IRA FLATOW: There’s another site that NASA has that looks like a beehive. LORI COLLINS: Yeah. These are really kind of unique buildings. So not only was Cape Canaveral all about the space race, but it was also about missiles, the Cold War era. And so in the ’60s and ’70s, these beehive structures were the launch command for the Minuteman missiles were launched from here. And they had these underground silos that the missiles would emerge from these. And the silos here are really interesting too because in 1987, after the Challenger disaster, parts of the Challenger are actually buried in these silos. They’re contained in these silos. So we’re really documenting quite an amazing sight when we’re capturing all of this in 3D. IRA FLATOW: I’m Ira Flatow. This is Science Friday from WNYC Studios, talking with Lori Collins of the University of South Florida. We are here in Tampa, Florida. Let’s go to the audience, get a question here. AUDIENCE: Hi, Ira. Hi, Lori. AUDIENCE: I am curious if this technology can be used on textiles. You’ve been talking a lot about three dimensional objects. I’m wondering if it could also be used for relatively flat but still three dimensional things like maybe the Bayeux tapestry I’m thinking, or some of the really ancient linens that are really hard to preserve once they get exposed to the air. LORI COLLINS: Absolutely. And I don’t want to give the impression that this is sort of a one size fits all kind of technology. We often use different types of tools. So we might use photogrammetric or photography kinds of imaging, as well as the scan data to provide us with information maybe on how a textile was actually made. And so we have used this on material. In particular, Guatemala with the textiles there, we’ve done some work with the museum on collecting data and information on textiles. IRA FLATOW: I see I got one more question for Dr. Collins from this side. Yes? AUDIENCE: So there’s a new product coming out called the Google HoloLens, and have you heard of it? LORI COLLINS: The HoloLens is actually a mixed reality tool. So there’s augmented reality, there’s virtual reality, and there’s mixed reality. Augmented reality puts layers of information sort of in front of you; virtual replaces it. You kind of put something over your eyes; and mix lets you actually interact with the information in front of you. So things like medical kinds of applications and surgeries and things, it’s a great way to train and teach and learn. And I see a lot of these things are being more and more integrated. We have a whole virtual reality studio where we look at all of our 3D models and take people into sites. And it’s a great way to teach and learn, especially everybody can’t go everywhere, but we can take them to these places virtually. IRA FLATOW: Speaking of going everywhere or anywhere, what site would you like to go or what would you like to scan that you haven’t been able to? Maybe they’re listening and they’ll give you access. Stranger things have known to happen on our show. LORI COLLINS: I mean, it’s kind of interesting with these technologies because people are actually scared of them. And so when technology comes out people tend to shut down and there’s that sort of reaction to permitting and being able to have access to things. So for example, a lot of the national parks that we work in, we have to really go through a lot of red tape to be able to fly a drone. So I would just like to be able to work in areas with greater access and with greater sharing capabilities with these data sets that currently don’t exist. And my favorite site to work in is probably Mexico. We have a site there called Chalcatzingo that is one of the 100 most imperiled rock art sites, and we’ve been documenting all of the ancient carvings at that site. And it’s just an incredible place to be and it’s got lots of stuff to scan. IRA FLATOW: Will you have to bring stuff back in from Mexico if you go there? IRA FLATOW: Thank you, doctor. Fascinating. Lori Collins is co-director of the Digital Heritage and Humanities Collection at the University of South Florida Libraries in Tampa. When we come back, from the ancient Mayans to the indigenous residents of the coastal Southeast, the world is full of human stories we haven’t fully told yet. Meet archaeologists who are unearthing those stories with the help of animal clues, the trails left by oysters, dogs, and even turkey bones. And now playing us another song, the Jackettes, welcome back to the stage. IRA FLATOW: This is “Science Friday” from WNYC Studios. Makerbot's Bre Pettis explains what you need to know to try your own 3D printing. This veterinary surgeon was confounded by how little we know about animal anatomy. So, he created a method to see all the way down to the smallest capillary.